With the holiday season fast approaching, may people start planning and booking their well deserved escapes from their daily busy lives. If you are currently carrying an injury or suffer pain on a daily basis, it is important to think about ways that allow you to travel more comfortably. No matter your size or age travelling can be uncomfortable. Whether you are travelling by car, plane or train the following tips can help reduce and avoid pain and discomfort while travelling. 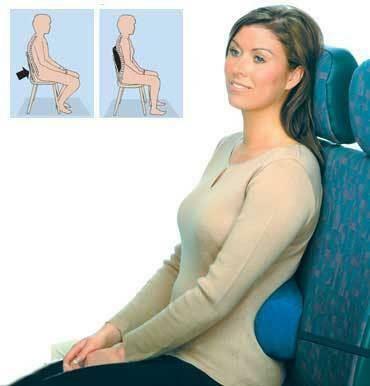 Back supports: Seating in cars, planes and trains often fail in providing effective support for the back and neck. A lumbar support pillow can be used to make your seated posture more comfortable by providing support to the curvature of your lumbar spine. They are light weight, portable and adjustable and will fit easily in with your hand luggage. If you forget to take one with you, try using your jumper, a blanket or ask for a small pillow while travelling. You can purchase lumbar supports from you treating physio. Neck pillows: These travel pillows are light weight and sometimes inflatable which fit comfortably around your neck, offering support for the curves of your neck. They help support these natural curves during prolonged periods of sitting. The can help prevent you from falling asleep in awkward postures and also prevent you from waking up with a painful neck at your destination. Move! : Sitting in the same posture for a prolonged period of causes tightness to the muscles of your back which puts stress on the spine. It is important to try and move every 30 minutes if you can when travelling. Movement increases blood flow to your muscles, preventing them from tightening and aching. Movement also prevents the formation of blood clots, or deep vein thrombosis (DVT). If you think that you are at risk, please speak with your GP prior to travelling. Heat or Ice: Knowing which modality your injury feels better with prior to travelling is important. If your injured area responds and settles with heat, purchase adhesive heat pads from your chemist. These can be easily applied directly to the skin and can provide warmth to the injured area for up to 4 hours. If you require ice for an inflammatory condition a small plastic bag filled with some ice cubes can be requested from airline staff and applied to the area for 20 minutes.